The recent USAF announcement that Avro has a contract to build what looks like a "flying saucer" (AW, Oct. 51, 1955, p. 14) overlooked one very interesting aspect of this aircraft, related to the Coanda effect on which its operation is based. This was described on pp. 456-465 of the "Proceedings of the Fifth International Congress for Applied Mechanics" (P.P. den Hartog and H. Peters, eds. ; John Wiley and Sons. NY, 1939). One significant application of the Coanda Nozzle was its use as a motorcycle engine muffler or silencer. Not only did it silence the exhaust, but the backpressure was less than for free discharge conditions. This indicates that the Avro saucer will probably be remarkably silent in operation. 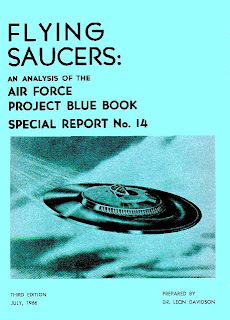 This feature is a further example of the astounding prescience of the great number of saucer observers who since 1947 have not only predicted the shape and performance of the Avro craft, but have also almost invariably remarked on the amazing silence of "saucers" in flight.